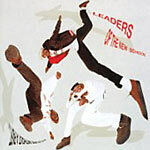 Reissue of the debut 1991 album by Leaders Of The New School. They began recording late in 1989 under the watchful eye of Chuck D and the Bomb Squad. The end result was their masterful ''A Future Without A Past.'' The group's members, Charlie Brown, Dinco D, Cut Monitor Milo & Busta Rhymes, each complement one another, mixing classic Cold Crush Brothers style routines with a ''New School'' edge. Often slept on, A Future Without A Past stands as a trail blazing release due to its mix of Jazz samples with fun creative story telling on top of pounding Hip Hop drums. With a sound so fresh and new, the production on the album rivaled what Public Enemy started and the Native Tongues finished. Often underappreciated, A Future Without A Past is 90s rap at its best and a must for any Busta Rhymes fan. 2. Case of the P.T.A. 4. What's The Pinocchio's Theory? 7. Sound of the Zeekers @#^**?! 15. Teachers, Don't Teach Us Nonsense! !